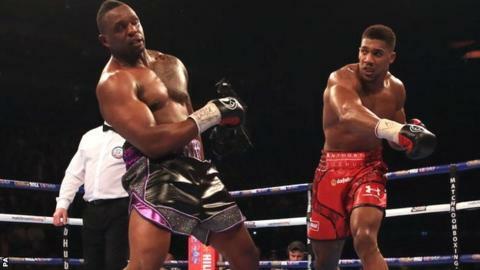 Anthony Joshua came through his first real test as a professional, knocking Dillian Whyte out in the seventh round to win the British heavyweight title. Olympic champion Joshua, 26, came into the fight boasting 14 straight knockouts in the first three rounds. But Whyte, 27, stood up to some huge blows and, perhaps more importantly, managed to land a few of his own. However, Whyte was wobbled by a hook to the temple before Joshua finished the job with a savage uppercut. With Whyte dangling on the ropes and seemingly unaware of his surroundings, referee Howard Foster called a halt to proceedings. Joshua's thrilling victory was greeted by raucous celebrations at the 20,000-capacity O2 Arena, making it abundantly clear that Britain has a new heavyweight hero. And Joshua's emergence could lead to some fascinating heavyweight encounters on these shores over the next few years. Next up for Watford's Joshua, who also retained his Commonwealth belt at the O2 Arena, could be compatriot and former world title challenger Dereck Chisora, who knocked out Croatian journeyman Jakov Gospic on the same bill. Britain's former world champion David Haye makes his comeback in January after a three-year injury lay-off, but promoter Eddie Hearn is unlikely to risk his prize asset against such a potentially dangerous opponent any time soon. The fight all of Britain would like to see is Joshua versus Tyson Fury, who won the WBA, IBF and WBO titles from Ukrainian Wladimir Klitschko in Dusseldorf a fortnight ago. Fury was later stripped of his IBF title. Fury and Klitschko will fight again next summer and if the Manchester boxer wins again, the clamour for him to fight Joshua will be deafening. "A world title fight is still far away," Joshua told BBC Radio 5 live. "Becoming an elite athlete in such a tough sport, it doesn't happen overnight but I've got the desire, ambition and the team around me to do it but I don't want to rush it because when I get there, I want to stay there." Before Saturday, Whyte was unbeaten in 16 pro fights, with 13 knockouts. He beat Joshua in the amateur ranks in 2009, was full of confidence during the build-up and it was hoped he might at least test his rival's chin. Whyte did indeed take it to Joshua in the first round, but took plenty of shuddering blows as a result and looked at one point as if he might not last three minutes. But what looked like a momentary buckling of the knees proved to be deceptive. A flurry of late blows by Joshua caused Whyte to retaliate, the Londoner attempting to punch Joshua while he was being held by the referee. This in turn led to both sets of entourages, plus security, invading the ring. A tense stand-off ensued before the canvas was cleared and the real action resumed. Joshua continued talking to Whyte at the start of the second, until he was staggered by a huge left hook. But while Joshua was clearly hurt, Whyte was unable to press home his advantage. By the third Whyte, who had been written off as a pretender by a lot of experts, had earned Joshua's full respect. And when the bell sounded for the start of the fourth - uncharted territory for Joshua - the fight seemed to be in the balance. Joshua managed to back Whyte up with his jab in the fourth, only for his rival to come back swinging and land with some grazing shots of his own. However, Whyte was taking in huge gulps of air by the end of the sixth and when he offered to touch gloves at the start of the seventh, it seemed like a sign of resignation. A left to the temple sent Whyte reeling across the ring, although he did well to compose himself, grab Joshua and tie him up on the inside. However, Whyte was unable to keep Joshua off for long. Whyte, having retreated to the ropes, was finally finished off by a picture-perfect uppercut. Having tried and failed to make it to his feet, he was given medical attention in the ring but soon helped back to his corner. "I really enjoyed it - it lived up to the hype. Let's give Dillian Whyte credit for rocking Anthony to his core with that shot and testing him. But Anthony's not the finished article and he'll learn from that fight tonight. "This is fantastic for British heavyweight boxing. Dillian has a good future. I think Anthony Joshua will be heavyweight champion of the world within 18 months. The right uppercut was a punch that would have knocked King Kong out."